Crazy, poetic life: On Writing ~ The first 50pgs. I began reading a book yesterday that has affected me so entirely, that I wanted to share a bit about it with you. 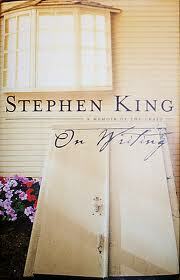 The book is called On Writing ~ A Memoir Of The Craft~ by Stephen King. In On Writing Stephen King explains ,through foggy childhood memories, how he has become the writer he is today. He then explains what he knows about writing through life experiences and how to go about the craft for aspiring writers. So far, this book has been really easy to read and hard to put down. It's funny, inspirational, and informative. I began with certain expectations on what the pages would contain, but I was taken by surprise on how much I love it. It's not like any other book on the craft of writing. I've only read a fourth of the book, but I've realized so much about what it means to be a writer. The first excerpt from the book that caught my attention is something every writer has and will experience (including myself). To read that Stephen King who has published a gazillion books (it seems) was rejected on numerous occasions causes me to be less weary of those letters that I have just begun to receive. ... And the way he handled it, not letting it get to him. He didn't even think twice about it. He just went on writing! His determination is my inspiration. The other excerpt that stood out is something I have yet to experience, but I often think this of myself. I'm guilty of being my worst critic. I've thought of my writing, my poetry... as being junk. I'm just not good enough. Self doubt seeps in and I tell myself that I'm wasting my time. I should just find something better to do. My supporters and readers have helped me learn to switch off the negative feelings and to keep moving forward, to keep writing. I am forever grateful of that. I find it really sad that she didn't support him. I understand that she didn't find that type of writing acceptable... but talent is talent. If only Miss Hisler could see him now! Stephen did however have a very supportive mother, that (to him) made all the difference in the world. I did not expect the first section to capture me like it has. I especially did not expect to smile as much as I have. His words on writing are calming my soul, they are reaching me at the perfect time as I take a step forward into unknown territory. I can't wait to delve into the rest of the book. ~ Leave me a comment below and connect with me on Twitter and Facebook. I'd love to hear your thoughts. Stephen King strikes me as a generous man. Carolyn See's book is also good, as are a dozen others, but King's book is a good core book for use any time. I liked your post. Thanks! This book just calls to me some how... it different than the rest. I'll have to look up Carolyn's book and check it out. Thanks for the tip. Isn't this book great? I enjoyed every word. His writing experiences are invaluable, his advice has stuck with me to this day, and his survival of being hit by a car were all compelling reads. Just like I was with many other of his books, I couldn't put this one down! His advice is staying with me too! I guess it's how he speaks to us. He relates to us on a level where we feel like we are equal to him. King’s book is on my reading list, about 10 away now. Another good book on writing, specifically poetry, is Ted Kooser’s Poetry Home Repair Manual. He writes in a conversational style and includes plenty of down to earth considerations when composing a poem. I enjoy your blog, Dana. It is honest and that is refreshing. Keep up the good work. I highly recommend it! I will have to check out Ted Kooser's book and put it on my to read list. I love when I get reading tips! Thank you for the kind comment and praise. It means more than you know! I must admit I've been silently stalking your poetry blog!